In the previous article I have explained how to find the unmatched records from two tables insql server and how to fill (bind) the Asp.net dropdownlist using Jquery andJSON. 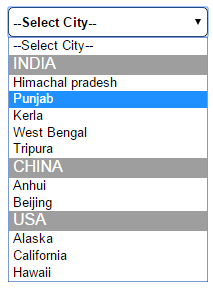 In this example I am going to display the Country and State name in a single dropdownlist. To implement the functionality I have created 2 tables Tb_Country and Tb_State. Insert some dummy records into tables. Create a function to populate the dropdownlist and call it on page load event. Now build, run the project and check the working example.. In this article we have learn how to fill category and Sub-category in single dropdownlist in asp.net using (C#, VB.net). I hope you enjoyed this article. Please post you comment, query and feedback about this article. You can like me on Facebook, Google+, Linkedin and Twitter via hit on Follow us Button and also can get update follow by Email.